I spent a little time up in Montreal, Canada this summer and was able to jump at a few different dropzones. The second place I visited was Parachute Montreal for the Canadian Headdown Record Attempts. Andrew and Alain had a lot to deal with and lots of pressure as they hosted the record for the first time. All in all, not only did they get a new Headdown Record for Canada of a 30-Way, but once that was completed they went back up and built Canada's largest Head Up Record of an 18-Way! 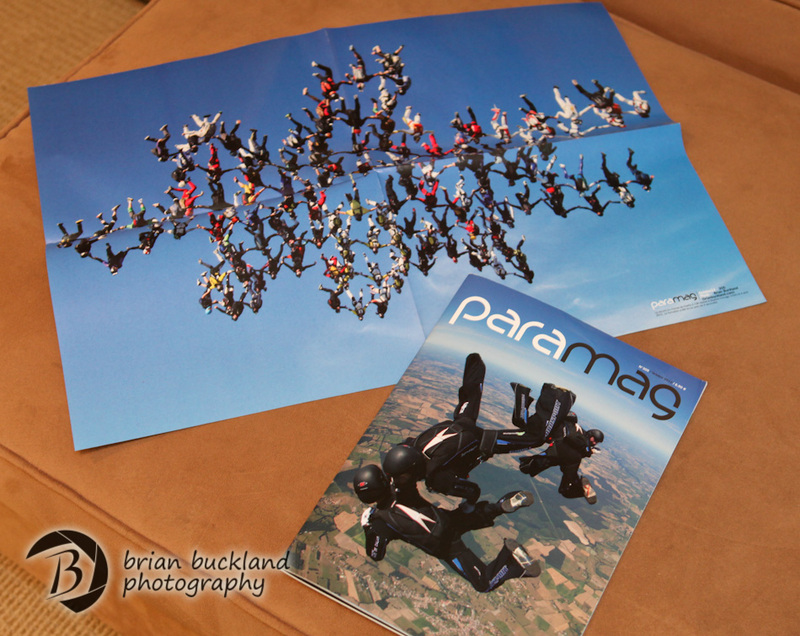 The French Skydiving Magazine is ParaMag. It is easily one of the nicest in the industry with it's heavy weight, high gloss pages that make the photos pop off the page. In their most recent issue I was lucky enough to have the centerfold shot from the most recent Vertical World Record. It shows the built 142-Way that is the current Unofficial World Record. The cover is a shot of the record from above taken by Rolf Kuratle. Once I got a closer look at his shot, I appreciated it so much more. The bonus for me here is that I'm actually in the shot! UPDATE!!! The above shots are what ParaMag had posted online a few weeks ago. Since then things have radically changed. Kuri's cover shot is not the cover and my shot is not the centerfold. I just got the actual issue in the mail and instead they swapped it out and took BOTH shots and printed them on a pull out, double fold poster with each of our shots on a side!!!! I thought I was taking it to the next level getting a pull out poster in Parachutist, now I've got double pull out posters in both Parachutist AND ParaMag. What an amazing experience.....thank you so much! Now, how do I follow this one up?!?!? Parachutist Magazine has been doing a great job of keeping up to date with not just the sport, but magazine publishing in general. Not only do they have a new look and feel with a bound magazine, but the type of paper adds to the entire experience. So when they approached me about doing a special project with my sponsors, I jumped on the opportunity. Their proposal was to put a removable poster into every magazine for their October issue. 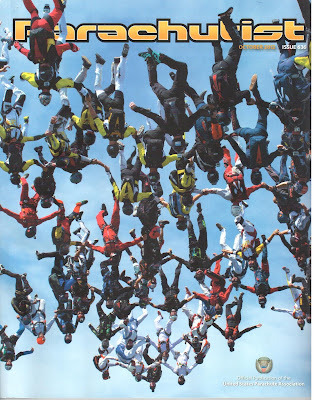 This double sided, double folded poster would open up to about 2 feet wide and would truly give the person looking at it great appreciation of the most recent 138-Way Vertical World Record. I just got my October issue in the mail and I have to say it was worth all of the work to make it happen! Thank you everyone at USPA / Parachutist for thinking outside of the box and allowing us to deliver a high quality shot of the new World Record to everyone's door. And Kudos to Norman Kent for a phenomenal cover shot!